Triple Play Professional Mound Clay is a unique blend of high-quality clays that have been specifically designed to withstand the stress of high traffic areas, such as your pitcher’s mound. Dark red in color, this product will add durability and strength to your soil, easily bind and conform to existing surfaces, and enhance your mound’s level of play. Triple Play Mound & Home Plate Kit is an all inclusive Mound and Home Plate repair and renovation package. It comes with enough unfired bricks, mound clay, and conditioner to do a full sized mound, both batters boxes, and your catcher’s box. Each kit contains 250 unfired clay bricks, 10 bags mound clay, and 10 bags red infield conditioner. A unique blue gumbo packing clay, Pro Mound bonds to form a solid subsurface in the mound and batters boxes that allows players to “dig in” and establish footing without leaving large holes. Also available in preformed brick. 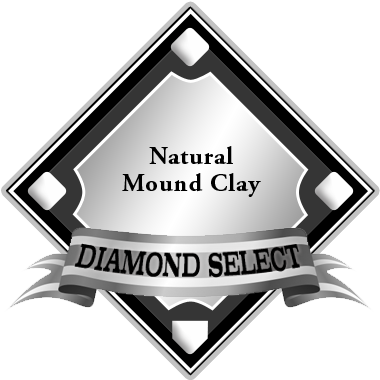 Diamond Select Natural Mound Clay is a mid-level blend of clay that has been designed the stress of high traffic areas such as your pitchers mound. This product will add durability and strength to your soil, easily bind and conform to existing surfaces, and enhance your mounds level of play. Louisville Slugger® Pitchers Mound Clay™ is screened heavy clay with a natural red color. This heavy clay has higher clay content than average products on the market. Louisville Slugger® Pitchers Mound Clay™ can be used in conjunction with other products or as a stand-alone, everyday maintenance clay. This clay can be used to construct, rebuild, or repair pitcher’s mounds, and catcher’s and batter’s boxes. Diamond Pro® Mound/ Home Plate Clay is a screened clay loam with a rich red color, which easily conforms and binds to the existing surface. The loose clay easily tamps into holes providing greater durability and less maintenance. Can be used to construct, rebuild or repair pitcher’s mounds, catcher’s and batter’s boxes.